Bactrian camels in the eastern Gobi Desert, followed by their herder. I was willing my time in China to its end those last few days. The pleasantries of the big cities had ceded to boredom with them, and I’d always been fascinated at the prospect of traveling across Mongolia. I’d read outrageous prices for the Beijing to Ulaanbaatar train. A tourist-focused affair, the route tends to be ploughed by trains that cost up to $400 US - a completely unaffordable proposition considering my budget. 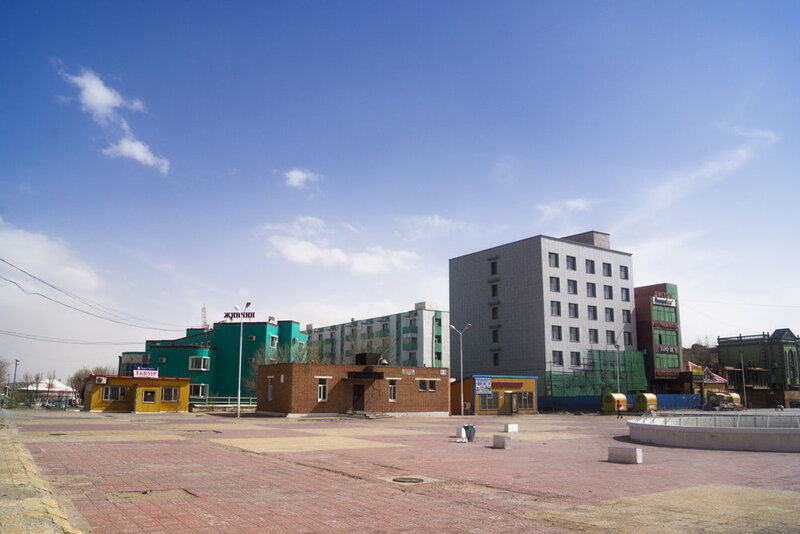 With the slightest effort, it is instead possible to inch your way on local trains to Erlian - the last stop in China - before crossing the border independently, and jumping on the local train from Zamiin Uud, Mongolia’s border town. And t2o do so would cost under $30 in total. The 11:55 rolled out of Beijing, northwest to Jining South - my first transfer. The views of inner Mongolia were generally apocolyptic. It is sparsely populated compared to the rest of China’s east, but the smog is extreme. Here, you get a sense of the scale of China’s energy output. Coal-fired plant after coal-fired plant line the train track. The towns are small, consisting of mainly single story red brick homes that must only harbour a room or two. There was an orange glow as the sun shone through the dense smog and reflected off the increasingly red earth. I disembarked the train in Erlian. The temperature was very low - around 5 degrees, waking me up. Erlian was also where I first saw Cyrillic. Three scripts - Mongolia, Mandarin and Cyrillic - sit side by side in this border town. It was an important moment for me: I could read again. I am no Russian speaker, but the Cyrillic alphabet is at least decipherable. It was a relief. I hadn't been able to phoneticise a local language since Indonesia, and I felt the immediate ease of being able to at least read road signs again relieving. At the station I met Lou and Sarah, a Canadian/New Zealand couple who’d also come up from Beijing. We teamed up, the three of us, to navigate the border crossing. It was a typical border affair - hiring an over-crowded shared taxi for a few bucks each, and waiting for hours until it was sufficiently full and the driver was happy. Exiting China was a breeze - though I was constantly bumping into horribly drunk Mongolian guys pouring out of local buses. The Chinese side of the border is nothing remarkable, though there is a giant, metallic rainbow that oddly straddles the entire building - one of the more unusual sites I’ve seen. Entering Mongolia was slower but hassle free. Soon, we were in Zamiin Uud, the first town in Mongolia. A dusty little outpost, Zamiin Uud typifies the sort of fly-in-fly-out town you often see at a border. Small, perhap only a thousand people or so, the town has a desolate, inviting atmosphere. At its heart lies the train station, where Lou, Sarah and I quickly headed to secure our tickets on the local sleeper to Ulaanbaatar that night. Lou in the back-streets of Zamiin Uud. We then walked the back streets of Zamiin Uud, exploring almost the entire town in an hour or so. Perched on the eastern fringe of the Gobi Desert, the town is overcome by sand and dust. It was grey and windy the day we were there. It felt very much the Mad Max scene as we pottered the sandy paths. The terrifying beast of a dog. I was loudly scourned by its owner for taking this snap. At one point, a ferocious bear of a dog seemed as if it were intent on killing us, so aggressive was its bark and charge towards us. Fortunately, the beast was kept at bay by a heavy chain that locked it to a wall. After loading up on snacks and cheap $2/litre vodka, the three of us found our carriage towards the end of the kilometer-long train, and settled in for our first evenings on the steppe. Mongolia in the early morning light. Taken from the train just before Ulaanbaatar. Travel by local train in Mongolia is a pure joy. The carriage was decked out in 1970s Russian decor, complete with smartly-uniformed attendants offering cheap and tasty snacks throughout the passage. Towards the end of each carriage was an incredibly antiquated coal-burning stove that boiled water, creating both a fire-hazard and sense of nostalgia for an era I never lived. For half the trip, a small local boy hung out with us, proudly sharing his lego-toys, but never saying a peep. The sun set over the radiant Gobi Desert. We rolled past Bactrian Camels and their nomadic herders, small hills and tiny villages thrust in the middle of nowhere. Lou, Sarah and I shared our disgusting vodka, and told stories of travels past. After a month of near-solitude in China, I wouldn’t shut up. We began to fade, and soon were all letting the rickety rhythms of the railway guide us to sleep, before waking on the fringes of another capital. A local Mongolian on the local train from Zamiin-Uud to Ulaanbaatar.